WEN has pioneered different technologies for its various engines, and this has made it the go-to company for innovative products, that combine power and performance in one functional unit. One of their latest inventions, the WEN 56180 generator, modeled with all these in mind. The WEN 56180 1800 watt gas powered portable generator review, focuses on the key features, the drawbacks, as well as the best uses for this powerful machine. 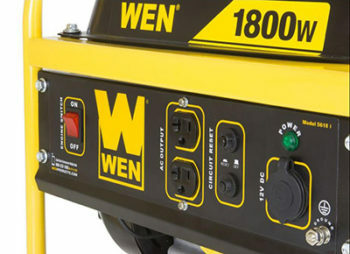 Since its establishment in 1951, WEN has been producing and distributing affordable and top quality power tools for the people of America and beyond. With its headquarters in Elgin, Illinois. 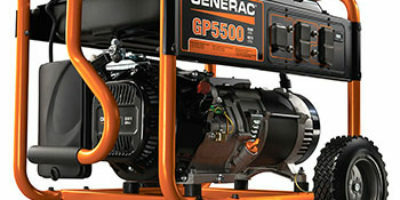 WEN products are usually backed by significant warranties that cover the generator, and its various parts from damage. Their service centers are spread across the country, and this ensures timely access to professional repair services. The WEN 56180 generator, produces 1500 watts of continuously running power and it’s starting wattage stands at 1800 watts. Has a 4 stroke OHV single cylinder engine that is quite reliable, and fuel-efficient. It employs a forced-air cooling system to prevent the engine from heating up to prohibitive levels. It comes in a lightweight and compact design for easy transportation. At just 50 pounds, this generator is one of the lightest engines around. It has handles on the side for increased portability. The engine is secured firmly on motor mounts located beneath the structure. This keeps the generator’s vibration to a minimum for a smooth, and quiet operation. It employs a noise muffler to make it as quiet as possible in operation. Its noise level stands at 65dB when at full load. This generator runs for 7.5 hours with a full tank at 50% load. Its gas tank capacity is 1.45 gallons, which burns about 0.386 gallons per hour at full load. Has the low-oil shutdown feature that automatically shuts down the engine when the level of oil drops to alarming levels. This protects the engine from damage. It’s an affordable, and durable machine that will serve you for a very long time. Also equipped with a spark arrestor to reduce the sparks in operation. This makes it safe to use in forests or national parks. Has a panel on the side for convenient handling of the generator and its functions. There are two 120V AC outlets and one 12V DC outlet, thus, you can easily connect the various appliances and tools that you intend to use at home, camp, or a construction site. EPA III approved and CARB compliant. Backed by a 2-year limited warranty for damage and repairs on all parts. At 65 decibels, this generator is relatively loud. It makes conversations difficult when it is placed nearby. When used in a camping site, it’s better to be placed far, so it would not act as a nuisance to your neighbors. It is not powerful enough for complex tasks such as powering up the AC unit in your home or RV. This limits the scale of its application. It is not ideal as an RV generator, and neither will it power heavy-duty construction tools at a job site. It lacks an electric start option. Requires a couple of pulls of the cord to get it to start. This can get quite tiring. It doesn’t function properly in cold temperatures. Starting it is particularly difficult when the temperatures are too low. It lacks wheels for easy movement, and transportation from place to place. Quality control enforced during manufacturing is poor for this machine. You may experience oil spillage when changing the oils since the generator lacks a long oil funnel. Understanding from the WEN 56180 1800 watt gas powered portable generator review, that it’s a great generator for light power needs. If you have a couple of heavy-duty electronics to power up in your home in a power outage, or at a construction site then this generator may not be what you are looking for. It is quite affordable and this makes it one of the best value for money generators in the market. 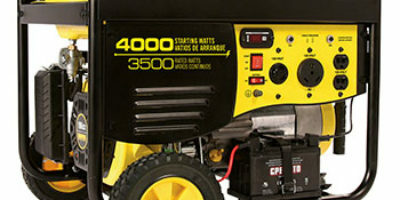 It’s durability and the good price tag is what takes it to the list of best rated portable generators of this year. It’s also lightweight and compact, which goes hand in hand to enhance your camping experience. The fact that it is EPA-approved and CARB compliant makes it an environmentally conscious generator. Therefore, it’s another reason for taking this generator outdoor. If you are looking for a lightweight and portable generator for light power appliances, then WEN 56180, is an amazing and affordable choice. When looking for an easy to use, portable generator for light power appliances then, WEN 56180, is a great and affordable choice.